We are often told by teachers, parents, and preachers to value substance over flash. Good advice. But as we will learn from feature stories in the new fall ’15 issue of CA-Modern magazine—shipping October 15—the world as we know it can’t get by without a little flash now and again. So get set right now for a big heap of flash—here’s a sneak preview of four new stories from the new CA-Modern. In ‘Dress to Express’ we meet a gaggle of folks who not only love to live in mid-century modern homes—they love to dress in mid-century style. “More of the new people in our neighborhood are really into midcentury modern. 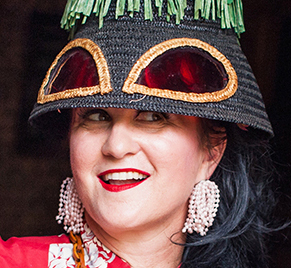 They’re into decorating their houses, but not so much into decorating themselves,” says Renee Underwood, who lives in a Concord Eichler and wears vintage fashion every day. “For me, it all goes hand in hand. 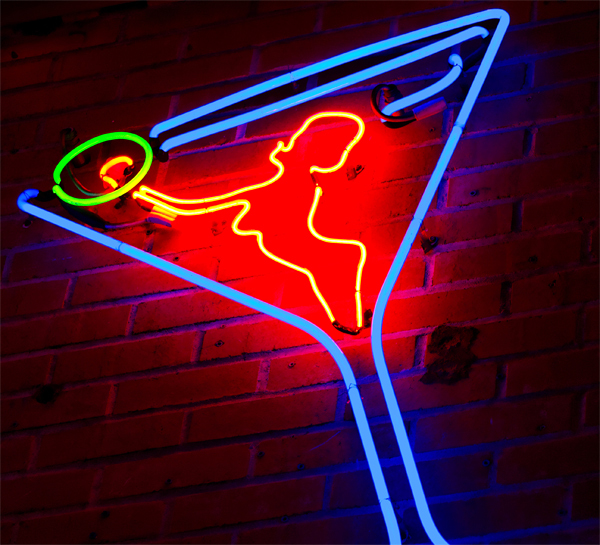 Neon signs too, like fashion, can seem at first to be something vainglorious, even exploitative, and certainly in bad taste. 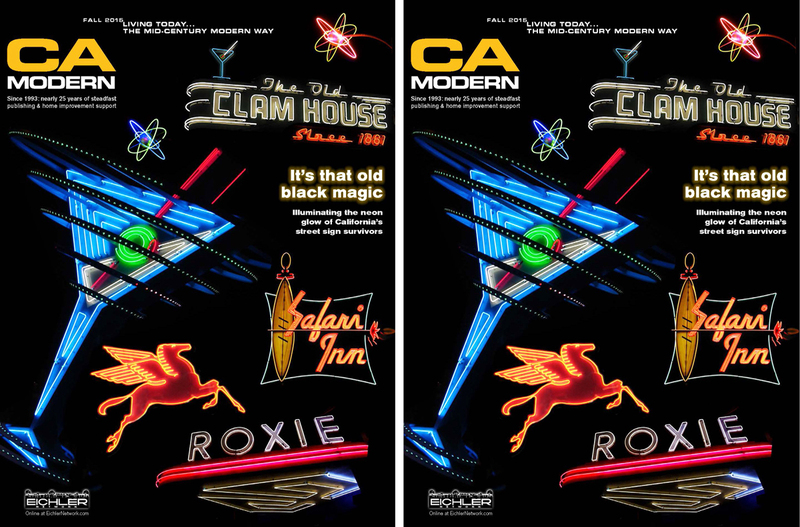 But don’t tell that to Kim Koga, who runs Glendale’s Museum of Neon Art. To Kim, whom we meet in ‘That Magic Glow,’ neon signs are like candles to a moth, they are tools of economic development and markers of sophisticated urbanity, and they are just downright beautiful. In ‘Fierceness Within,’ another in our ‘Art About the House’ series exploring the work of mid-century artists and contemporary artists of a mid-century modern bent, we meet Mary Fuller McChesney, whose sculptures can suggest ancient civilizations and primordial, even primal feelings. She developed a very unique way to sculpt in concrete, turning out public art and art for private homes and gardens, often of cats both domestic and wild, and of creatures that are hard to name. The strength of her forms clearly suggests a strength within the artist herself. 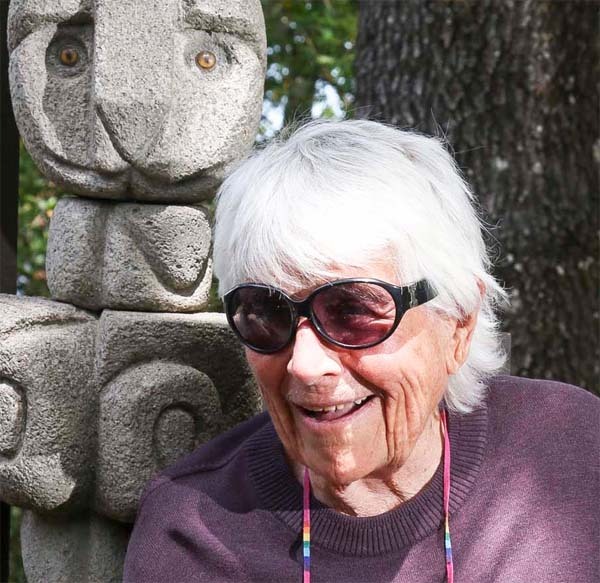 Mary has been creating art since the 1940s and was an important player in, and a historian of, the exciting Bay Area arts scene that flourished in the mid-century. She’s also been a fighter for causes political and environmental.